The TrayVu combines an in-flight entertainment system with a see-through tray. That ugly, and often dirty, airplane tray table may soon be getting a makeover. 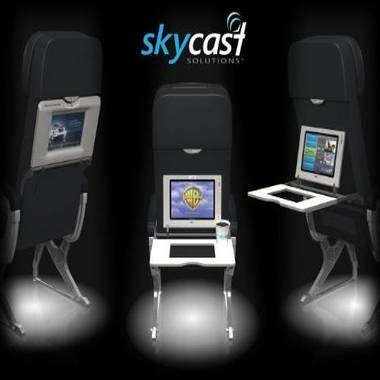 The TrayVu, created by Skycast Solutions, combines an in-flight entertainment system with a see-through tray. The TrayVu, displayed this week at the 2011 Aircraft Interiors Expo in Seattle, includes an Android tablet with an 8.9-inch screen that can be viewed through a clear section of the table when the tray is in the upright position. When the tray is lowered, the tablet stays connected but flips up to allow full use of the space on the tray. TrayVu hasn’t been picked up by any airlines yet, but when it does, passengers will be able to watch movies (and ads), play games with others in the cabin (and see them on the built-in camera), use the credit card reader to order food and drinks, and even run up a tab for items purchased for other passengers, such as their children — or that cute guy across the aisle. It sounds promising, but won’t that see-through section of the tray-table get dirty? Find more by Harriet Baskas on Stuck at The Airport.com and follow her on Twitter.